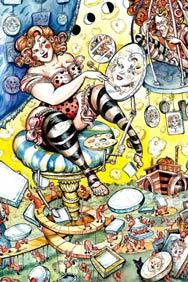 We do not curently have theatre tickets available for Dr Sketchy's Anti-Art School. This could be because we have simply sold out or it could be that this show is no longer running. The information on this page remains purely for historical and informational purposes. Grab your sketch book and come to Dr. Sketchy's anti-art school, where life drawing meets cabaret. Sketch glamorous models and compete in drawing contests in an atmosphere of artistic mayhem. Dr. Sketchy is for everyone, with no previous artistic ability required. So don't be shy: put pencil to paper, move it around and see what happens  you might be surprised!